Cavaliers small forward Kyle Korver posted 18 Points in a 4 out 6 shooting in the 3 point area helping the Cavs to end their 2 game losing skid in a win against Sacramento Kings 120 – 108 at Golden 1 Center. The Cavs improve their standings to 29 wins and 10 loss maintaining the number 1 spot in the Eastern Conference. Kyle Korver who debuted in Cavs uniform finally happen at Vivint Smart Home Arena against one of his former team the Utah Jazz, Korver scores only 2 points in a losing team. On his second game the Cavaliers played Portland Trailblazer at Moda Center, Korver scores only 2 points and again in a losing effort. Finally on his third game with the Cavaliers, the Kyle Korver that we know finally shows up, shooting dead shots and making the right play for him. As expected he will be a great addition to the already a great 3 point shooting team which is currently the second best 3 point shooting in the current 2016 – 2017 NBA Season. 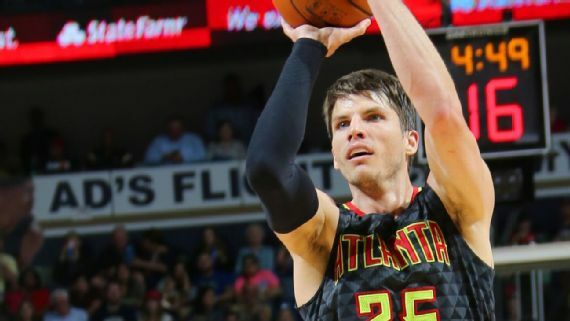 Many sports analyst think that the addition of Kyle Korver with the Cavaliers improved their chances of winning back to back NBA Championship and at the same time Korver has a great resemble to NBA retired and future Hall of Famer Ray Allen, one of the greatest shooter in NBA History. Korver might be the best shooter in Cavs rooster until he finally fit in with the team like he show’s on tonight’s game. Meanwhile, on January 16 (US Time), Kyle Korver will be tested against Golden State Warrior, he will be a good potential match up against another 3 point shooting team with the likes of Stephen Curry and Klay Thompson. The game between the Cavs and GSW could be a potential preview of 2016-2017 NBA Finals Match? No Comment to " Kyle Korver Scores 18 points, Get his First Win in CAVS Uniform "